This top quality antique French Empire style writing table / desk was made by the well-regarded cabinet makers Krieger of Paris. All three locks are stamped and there is also a metal label on the inside of one of the drawers. 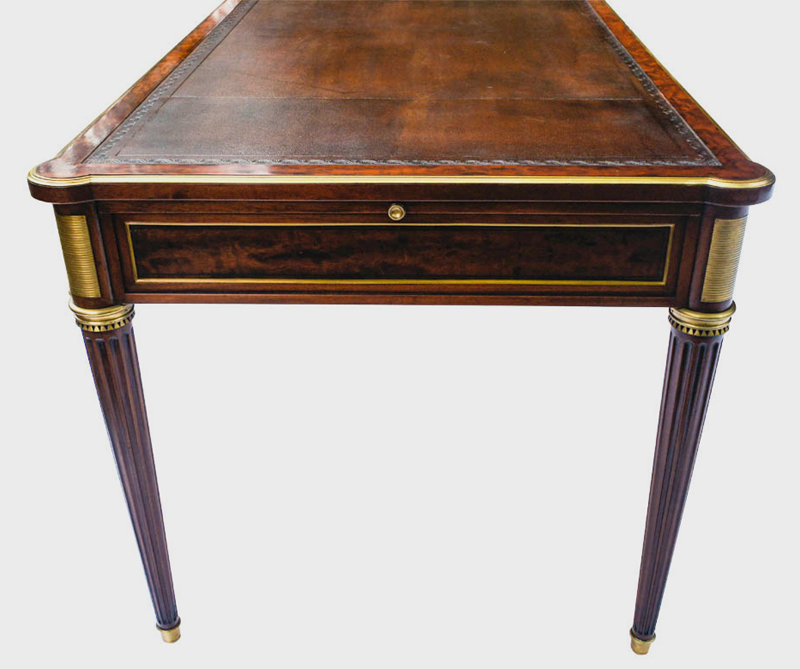 The writing table is made with 'plum pudding' mahogany with ormolu mounts. It has recently benefitted from traditional restoration including cleaning, polishing and waxing. 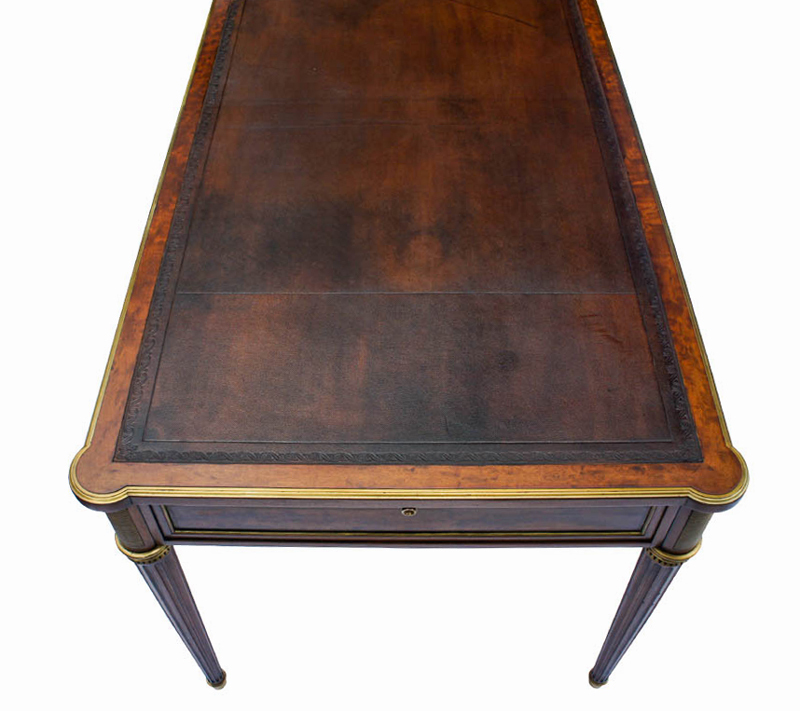 This top quality antique French Empire style writing table or desk was made by the well-regarded cabinet makers *Krieger of Paris. All three locks are stamped and there is also a metal label on the inside of one of the drawers. 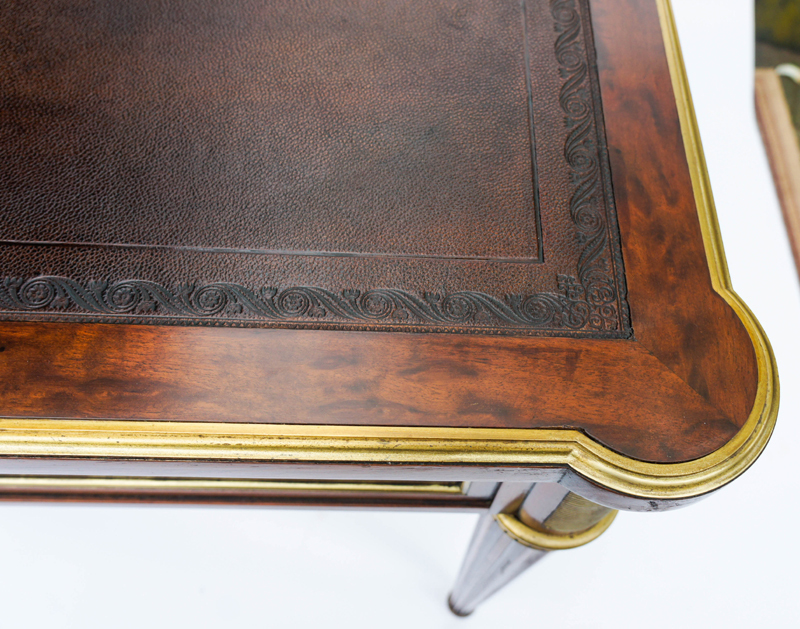 The writing table is made with 'plum pudding' mahogany with ormolu mounts. The top is fitted with the original mottled brown Morocco leather writing surface with blind tooling. 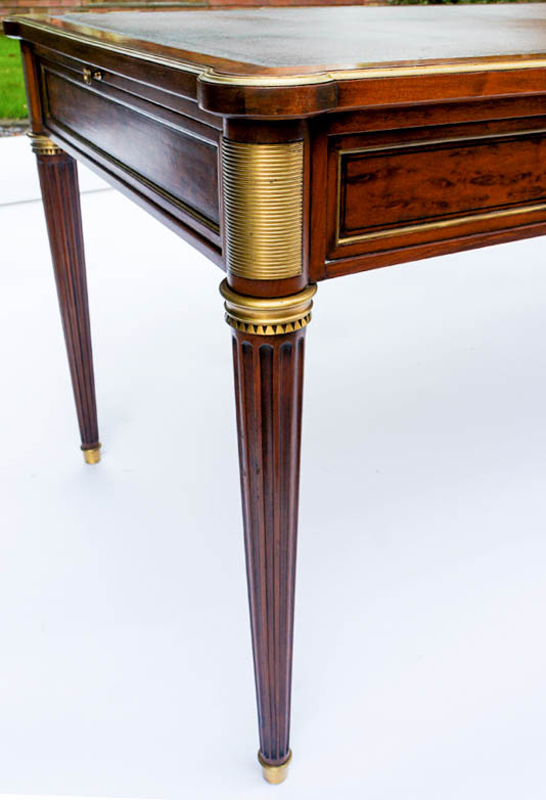 This is surrounded by a band of mahogany with a shaped ormolu edge and pronounced rounded corners. The table is fitted with three oak lined drawers with the original locks and two keys. 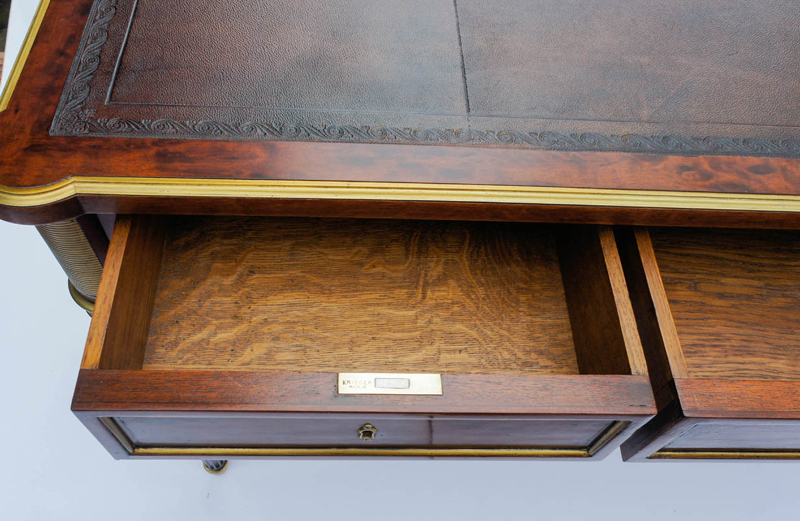 The front of the drawers are decorated with brass mouldings and ebony stringing inlay. Both ends of the table have extending writing slides to increase the working surface. The back and side of the table are panelled in the same design as the drawer fronts. 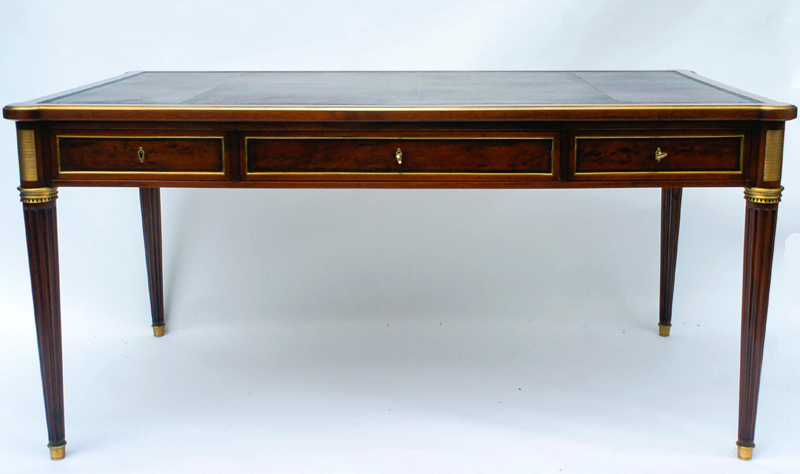 This well-proportioned antique writing table or desk is in excellent antique condition and ready to grace your home or office. *The cabinet makers Maison Krieger was established in the furniture making district of Faubourg, Stainte Antoine, Paris, in 1826. The firm exhibited their furniture throughout the 19th century notably at the Universal Exhibitions of 1851, 1855 and 1900. ‘Maison Krieger’ was a highly regarded company particularly for the quality of their work. Their name has also been associated with 'Fracois Linke' (a prestigious French furniture maker) and some of Krieger's labels have been found on Linke' pieces.